This is a list of Orkney islands in Scotland. The Orkney archipelago is located 16 kilometres (9.9 mi) north of mainland Scotland and comprises over 70 islands and skerries, of which 20 are permanently inhabited. In addition to the Orkney Mainland there are three groups of islands. The North and South Isles lie respectively north and south of Mainland. The Pentland Skerries are a group of small islands in the Pentland Firth, a dangerous stretch of water between mainland Scotland and the larger islands of Orkney, through which run the strongest tidal streams in Britain. The Isle of Stroma is often mistakenly included with the Orkney Islands, but is part of Caithness. The definition of an island used in this list is that it is 'land that is surrounded by seawater on a daily basis, but not necessarily at all stages of the tide, excluding human devices such as bridges and causeways'. There are four islands joined to the Orkney Mainland by a series of causeways known as the Churchill Barriers. They are South Ronaldsay, Burray, Lamb Holm and Glimps Holm. In addition, Hunda is connected to Burray by a causeway. The barriers were constructed by Italian prisoners-of-war as a means of preventing enemy submarine access to the vast natural harbour of Scapa Flow after the sinking of HMS Royal Oak by a German U-boat in 1939 with the loss of 883 lives. The Italian prisoners constructed a small Roman Catholic chapel on Lamb Holm as a place of worship during their incarceration. Most of the islands have a bedrock formed from Old Red Sandstone, which is about 400 million years old, and was laid down in the Devonian period. The islands have good agricultural qualities and have been continuously inhabited for thousands of years, as evidenced by the World Heritage Site of the Heart of Neolithic Orkney. The archipelago is exposed to wind and tide, and there are numerous lighthouses as an aid to navigation. The European Marine Energy Centre, which is located at Stromness, is currently testing various wave and tidal energy devices from Billia Croo on the Mainland and Eday. The islands all fall within the Orkney Islands Council area. Most of the larger islands have development trusts that support the local economy. The total population of Orkney increased from 19,245 in 2001 to 21,349 at the time of the 2011 census. This is a list of islands with an area greater than 15 hectares (approximately 37 acres). Records for the last date of settlement for the smaller uninhabited islands are incomplete, but all of the islands listed here would have been inhabited at some point during the Neolithic, Pictish or Norse periods. 'Ward Hill' or a variant thereof is very common as the name of the highest point on the island. These locations are named after those high places used for the lighting of warning beacons. The population of the tidal islet of Holm of Grimbister was not recorded by the 2001 census, although it was inhabited in 2010 and probably earlier. It did appear in the 2011 tables. The population of Inner Holm in 2001 was one, although the figure was included in the total for Mainland at the time of the 2001 census. Lamb Holm is "included in the NRS statistical geography for inhabited islands but had no usual residents at the time of either the 2001 or 2011 censuses". Papa Stronsay had usually resident population of 10 in 2001 but was apparently not permanently inhabited in 2011. This is a continuing list of uninhabited smaller Orkney islands (many of which are called "Holm" from the Old Norse holmr, meaning a small and rounded islet), tidal islets only separated at higher stages of the tide, or skerries which are only exposed at lower stages of the tide. Auskerry: Lunga Skerries, Oessen Skerry, The Clett. Calf of Eday: Lashy Skerries, The Bow. Copinsay: Black Holm, Corn Holm, Horse of Copinsay, Scarf Skerry, Sow Skerry, Ward Holm. Eday: Green Holm, Red Holm, Rusk Holm. Gairsay: Holm of Boray, Holm of Rendall, Little Seal Skerry, Skertours, Taing Skerry. Glimps Holm: Dulse Skerry, Glimpsholm Skerry. Graemsay: Middle Skerry, Skerry of Cletts, Sour Skerry, Sow Skerry. Hoy: Grassy Cletts, Inner Skerry, Middle Skerry, Old Man of Hoy, Outer Skerry, The Needle. Mainland: Bo Skerry, Bow Skerries, Braga, Brough of Bigging, Holm of Houton, Holm of Rendall, Iceland Skerry, Kirk Rocks, Little Skerry, Mirkady Point, Nevi Skerry, Outer Holm, Oyster Skerries, Puldrite Skerry, Quanterness Skerry, Scare Gun, Seal Skerry, Skaill Skerries, Skerries of Clestrain, Skerries of Coubister, Skerries of Lakequoy, Skerry of Work, Skerry of Yinstay, Smoogro Skerry, Thieves Holm, Whyabatten, Yesnaby Castle. Muckle Skerry: Clettack Skerry, Little Skerry, Louther Skerry. North Ronaldsay: Altars of Linnay, Green Skerry, Hoe Skerries, Reefdyke, Seal Skerry. Papa Stronsay: Jack's Hole, Jack's Reef. Papa Westray: Cairn Head, Muckle Quoy. Rousay: Little Brig, Muckle Brig. Shapinsay: Broad Shoal, Grass Holm, Skerry of Vasa. Stronsay: Holms of Spurness, Ingale Skerry, Little Linga, The Bow. Swona: Selki Skerry, South Clett, The Tails of the Tarff, West Wini Skerry. Westray: Holm of Aikerness, Shell Holm, Skea Skerries, Wart Holm. The remote islets of Sule Skerry and Sule Stack, which lie 37 miles (60 km) west of the archipelago form part of Orkney for local government purposes. General Register Office for Scotland (28 November 2003) Scotland's Census 2001 – Occasional Paper No 10: Statistics for Inhabited Islands. Retrieved 26 February 2012. National Records of Scotland (15 August 2013) (pdf) Statistical Bulletin: 2011 Census: First Results on Population and Household Estimates for Scotland - Release 1C (Part Two). "Appendix 2: Population and households on Scotland’s inhabited islands". Retrieved 17 August 2013. ^ Lawrence, Martin (2003) The Yachtsman's Pilot: North and East Scotland. St Ives. Imray, Laurie, Norie and Wilson, p. 108. ^ Various other definitions are used in the Scottish context. For example the General Register Office for Scotland defined an island as 'a mass of land surrounded by water, separate from the Scottish mainland' but although they included islands linked by bridges etc. this is not clear from this definition. Haswell-Smith (2004) uses "an Island is a piece of land or group of pieces of land which is entirely surrounded by water at Lowest Astronomical Tide and to which there is no permanent means of dry access". This is widely agreed to be unhelpful as it consciously excludes bridged islands. ^ Lamb Holm and Glimps Holm are also occasionally referred to as 'Lambholm' and 'Glimsholm'. See for example Wenham, Sheena "The South Isles", in Omand (2003) p. 210. ^ Wenham, Sheena "Modern Times" in Omand (2003) pp. 108-9. ^ McKirdy, Alan Gordon, John & Crofts, Roger (2007) Land of Mountain and Flood: The Geology and Landforms of Scotland. Edinburgh. Birlinn. 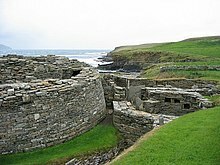 ^ "Walk in Scotland: Orkney and Shetland" Visit Scotland. Retrieved 15 July 2007. ^ "Lighthouse Library" Northern Lighthouse Board. Retrieved 1 May 2012. ^ "EMEC Orkney" European Marine Energy Centre. Retrieved 3 February 2007. ^ "Directory of Members' Archived 2010-07-19 at the Wayback Machine DTA Scotland. Retrieved 1 May 2012. ^ "Orkney Communities are doing it for themselves" Archived 2015-12-27 at the Wayback Machine (23 August 2007 et seq) Orkney Today. Retrieved 15 September 2007. ^ "Orkney Placenames - natural elements" Orkneyjar. Retrieved 15 July 2007. ^ Haswell-Smith (2004) Scottish Islands save those indicated with a separate footnote. ^ For uninhabited islands indicates the last known date of permanent, year round settlement. Information is from Haswell-Smith (2004) Scottish Islands save those indicated with a separate footnote. ^ Haswell-Smith (2004) Scottish Islands and Ordnance Survey maps. ^ Ordnance Survey maps. Note that the maps mark the height above sea level of a high point on most islands, but in a small number of cases, this may not be the highest point. ^ a b c d e f g h i j k l m Rick Livingstone’s Tables of the Islands of Scotland (pdf) Argyll Yacht Charters. Retrieved 12 Dec 2011. ^ a b c An estimate based on Ordnance Survey maps. ^ a b Neither the 2001 nor 2011 censuses list South Walls as an island, but include the population total in Hoy. ^ Wenham, Sheena "The South Isles" in Omand (2003) p. 208. ^ Haswell-Smith (2004) maintains there is no written record of any post-Neolithic habitation, although Sheena Wenham ("The South Isles" in Omand (2003) p. 208) states the island supported a community "into the 20th century". ^ Ross, Calum (3 Mar 2010) "Tory candidate pulls out of race for city seat at general election". Press and Journal. Aberdeen. Retrieved 26 Feb 2012. ^ Waugh, Doreen J., "Orkney Place-names" in Omand, (2003) p. 119.